What are the most popular online bachelor's degrees offered in Oregon? Oregon is one of 16 member states participating in the Western Interstate Commission for Higher Education (WICHE). Inclusion in this commission grants numerous benefits to online learners, such as significantly lower tuition rates and interstate cooperation that allow students to pursue degree and certificate programs that are not offered in their home state. Efforts to improve online education in Oregon began in 1995 with the creation of the Oregon Public Education Network (OPEN), a coordinated online network that gave students and teachers access to technology-based instruction. Though OPEN disbanded in 2006, online education remains strong in Oregon. By the 2002-03 academic year -- just 7 years after the founding of OPEN -- more than 30,000 community college students were participating in online learning opportunities and the Oregon University System was offering more than 800 web-based courses. The asynchronous course format of online education makes it an attractive choice for working students, as lectures and readings can be completed at the student's desired pace. For students who still want to attend some on-campus instruction, hybrid courses feature a combination of online learning and on-campus sessions, such as labs and lectures. WICHE membership provides generous tuition breaks for out-of-state programs and, as is the case in most states, online colleges in Oregon generally offer lower tuition fees to students who remain in their home state for higher education. With its main campus in the smart and green city of Corvallis, Oregon State serves over 30,500 students through its multiple on-campus and virtual locations. The school’s offering of bachelor’s degrees in the arts and sciences ranks high among all Oregon online colleges, with recently added options in French, history, and business administration. A unique post-baccalaureate program is offered in computer science with one- to four-year track options; candidates do not need previous experience in the CS field to apply. Oregon State’s BS in sustainability program is a double degree, which can be completed alongside any other OSU degree. It prepares socially and environmentally savvy leaders in business, economics, and politics. The school offers competitive tuition rates and a full suite of student services, from online tutoring to career services. All students work with a personal advisor to craft a program of study that fits their schedule and career objectives. Courses are delivered through the Canvas online learning portal. WPC offers a selection of professionally-focus degrees makes it one of the top online colleges in Oregon. Distance learners can select from five programs: business administration, healthcare administration, human development, organized dynamics, and a hybrid RN to BSN that requires just one weekly campus meeting. The organized dynamics program is an associate degree, while all other programs are bachelor’s degrees. Some of the bachelor’s programs, including human development and the RN to BSN, are completion degrees and require applicants to possess an associate degree in a relevant field. All of WPC’s online degrees are organized in a cohort format that allows students to move through most courses together as a cohesive group. Candidates typically work alongside the same group of 14-22 students throughout the course of their program, building lasting connections both personal and professional. All programs offer monthly start dates, making it possible for students to enroll whenever it suits their schedule. NCU is a private liberal arts college that is affiliated with the Disciples of Christ and is one of the best online schools in Oregon. The school offers a variety of distance learning programs in psychology, accounting, business administration, nursing, and interdisciplinary studies. The interdisciplinary studies program allows students to explore three distinct academic areas, with options including bible and theology, communication, criminal justice, mathematics, and teacher education. NCU offers courses in an accelerated eight-week format, with year-round enrollment options that allow distance learners to earn credits faster than normal. The school also offers six start dates throughout the year, making it even more convenient for working professionals. Students who live in the Eugene area can enroll in hybrid degree options that combine online study with campus sessions that are held one night per week. The school boasts a 12-to-1 student-to-teacher ratio that ensures that all students receive one-on-one attention from faculty. One of the best online colleges in Oregon, Portland State offers innovative undergraduate degrees and certificates, with bachelor’s programs in arts and letters; criminology and criminal justice; liberal studies; management and leadership; social work; and supply and logistics management. Several programs, including its business degrees, are accredited by national professional organizations. The arts and letters program, with an interdisciplinary degree in subjects like applied linguistics and art history, is an ideal option for independent and self-directed learners. All programs include an assigned personal program manager to help keep students on track with their academic and professional goals. PSU courses are taught by the same faculty as those on-campus, and include opportunities to collaborate with peers through video-conferencing and team projects. Portland State is a public research university with a mission to “let knowledge serve the city" in finding innovative solutions to local and global issues. The university is one of only 30 colleges in the country to hold the status of “Changemaker Campus” for its dedication to socially and environmentally conscious educational programs. Oregon Tech offers five online undergraduate degree programs in the professional and technical fields: applied psychology; health informatics; information technology; operations management; and technology & management. Online courses are delivered through the Blackboard Learn platform with available mobile access. Oregon Tech graduates 90% of its students, and 83% of graduates find a job within six months. Degree programs are added every year to keep up with student interests and demand in the field. The applied psychology program, available through one of the top online colleges in Oregon, allows students to explore several potential career options in the field through an externship, which pairs students with agencies, organizations, or businesses in a student’s town of residence. Students with an associate degree or no college experience can apply to the operations management program, while the technology and management degree is designed specifically for students who have completed an associate degree in a technical field. Students can choose from two flexible and versatile online bachelor’s degree programs in business or psychology at Corban, one of the best online colleges in Oregon. Though no previous college coursework is required for these programs, an admissions counselor works with students to help determine the maximum number of transfer credits that can be applied towards the 129 credits required for degree completion. Both programs offer multiple areas of concentration to align with students’ desired expertise. Programs are self-paced and structured over eight-week terms, with most students taking between one and three classes each term. Corban’s curriculum is rooted in biblical teachings and Christian values. The name Corban is borrowed from the Old Testament, a Hebrew term that the university has interpreted as an “offering to the Lord”. Corban maintains an active blog and Twitter presence to help keep students engaged and connected with events and news on campus. In addition to its main campus in La Grande, EOU maintains regional advising centers throughout the state and offers online programs as one of the top-ranked Oregon online colleges. Bachelor’s degree programs are available in business administration or emergency medical services administration, the latter of which is an exclusive online program designed for EMTs and the only one of its kind on the West Coast that is approved by the National Fire Academy. The emergency medical services program is designed based on the academy’s FESHE model curriculum, and prepares paramedics to become managers and administrators in the field. Cost-per-credit tuition rates for both programs are very competitive, and students work one-on-one with an academic advisor to personalize a course of study that fits their life experience and future career goals. Students access all online coursework and engage with peers and faculty through the Canvas learning management platform. Online academic resources include eTutoring, an online writing center, librarian chat services, and more. George Fox offers a hybrid online management and organizational leadership degree, designed specifically for working adults and one of the only of its kind among online colleges in Oregon. Delivered in an accelerated, 16-month format, content is identical to that of the on-campus program. One in-person weekend orientation is required at the start of the program, allowing students to form connections with fellow peers and their professors. Applicants are required to have 62 college credits to enter the program, and students can complete online general education courses through George Fox to meet that minimum. George Fox offers a 14:1 student-to-faculty ratio with online class sizes less than the average on-campus class size of 21. George Fox is one of 11 universities in the nation, along with others like Yale and Cal Tech, to be part of the Richter Scholars Program, which helps fund students’ independent research projects. Notable alumni include former President Herbert Hoover, famed basketball coach Ken Carter, and award-winning Journalist Scott Jensen. MU offers a choice of four online bachelor degrees in Bible and theology, business administration, business and organizational psychology, and psychology. All 124-credit programs at one of the best online colleges in Oregon open doors to a variety of career options, with curriculum grounded in ethics and Christian values. Multnomah also offers two accelerated degree completion programs, for students with previous college experience, in applied psychology and business management. The MU Online classroom is accessed through the user-friendly Canvas learning management system, complete with mobile access and videoconferencing tools. Courses are asynchronous and most students dedicate a minimum of 10 hours each week to coursework. Although students are not required to come to campus, they’re invited to set up face-to-face meetings with professors at anytime. Students may be eligible to transfer up to 80 credits from an accredited institution towards their degree requirements. Notable MU alumni include Author Randy Alcorn and global businessman Dave Munson. CU offers three reputable online bachelor’s degrees in early childhood education, healthcare administration, or homeland security & emergency preparedness. Online programs through one of the best online colleges in Oregon are as rigorous as those offered on campus. An average class size between six and 18 students allows for collaborative work with peers from all 50 states and 11 countries. Students work with an enrollment specialist upon being admitted and explore scholarships, grants, and other funding opportunities. CU was founded based on Lutheran theology and traditions, and the university maintains partnerships with businesses, nonprofits, and other community organizations to leverage opportunities for students in service, internships, and curriculum development. Students and alumni stay connected with Concordia through social media, from Facebook to Instagram to YouTube. In a 2016 student survey, 91% of Concordia students expressed satisfaction with their education experience at CU. SOU, located in Ashland, offers a variety of online bachelor's and master's degrees. The school’s undergraduate programs cover subjects including management, criminology and criminal justice, innovation and leadership, early childhood development, and business administration. The business administration program offers optional concentrations in hospitality management, accounting, or general management. All SOU undergraduate degrees are completion program that require applicants to hold an associate degree or equivalent credits from an accredited two- or four-year college. Students who hold a bachelor’s degree can also pursue several online endorsement/licensure programs, such as a nonprofit management certificate, an accounting certificate, and endorsements in special education or English for speakers of other languages. SOU offers graduate degrees in business administration, education/continuing teaching license, and theater education with an emphasis in production and design. Distance learners have access to wide variety of support services and resources, including library services, enrollment services, academic advising, disability resources, and academic tutoring services. Marylhurst is a nonprofit liberal arts and business university located in Portland, Oregon, and one of the top-ranked Oregon online colleges. The university offers a fully-online BA or BAS in business management, as well as a BA in English literature & writing. Students can also opt for a hybrid program that combines online and on-campus courses for either degree. Only the English literature concentration is available online for the bachelor’s in English program. Full-time faculty and established authors for this program include Jay Ponteri and Natalie Serber. Students enrolled in the IACBE-accredited business program can earn prior credit for life or work experience. A business program focus on social justice and advocacy gives students a strong foundation for careers in nonprofit organizations and the public sector. All courses are accessed through the Canvas learning management platform. Marylhurst is recognized as a military-friendly school and honors all military benefits and scholarships. NHCC is a private religious college located in Eugene that ranks among the top Christian online colleges in Oregon. The school offers an associate of science in ministry leadership that can be completed entirely online in 26 months. This 63-credit degree prepares graduates to pursue spiritual leadership and ministry positions or for further study, transferring seamlessly into NHCC’s campus bachelor’s programs. The curriculum includes 21 courses that cover topics such as fundamentals of theology, discipling and mentoring in the Christian faith, biblical stewardship, and ministry leadership strategies. Students also learn general guidance and management skills though courses including leadership essentials and communication for leaders. All distance learners join the degree as part of a cohort group, which includes 8-16 students of varied cultural and ministry backgrounds. This diversity allows students to learn from one another, creating a unique educational community. If you want to qualify for a range of high-paying job opportunities, earning a college degree is key. When deciding where and what you want to study, you may end up weighing both in-state and out-of-state schools. If you are from Oregon, there are many advantages to attending college in your home state. Sticking close to home can qualify you for in-state tuition and help you build a network of regional professional contacts. You may also benefit from your school's name recognition on the local job market, and you'll be relatively close by if you need to occasionally visit campus. When researching programs, be sure to consider our list of the most affordable online colleges in Oregon. All of the schools in this list are accredited, and our rankings highlight the colleges that offer the best blend of affordable tuition and return on investment. The Online and Continuing Education Program at Linfield College provides working professionals with classes that meet their demanding schedules. One of the oldest colleges on the West Coast, Linfield started offering distance education courses in 1975. Linfield offers online degrees in fields such as global studies and accounting, as well as an RN to BSN for licensed nurses. Students can also select from several minors. Admission requires a transcript from each previous college attended. If applicants have not previously attended college, then they must submit either their high school diploma or proof of a GED. Linfield’s tuition is the same for all students regardless of residency status, making it one of the most affordable private online colleges in Oregon. Oregon Institute of Technology offers an array of online programs for students who need a flexible education. In addition to associate degrees, the school allows students to earn bachelor’s degrees in fields like psychology and health informatics as well as master’s degrees in allied health and engineering. The school also offers bachelor’s degrees in dental hygiene and radiologic science. Tuition for online and on-campus students is the same. Applicants must submit an application and transcripts from previously attended colleges. Undergraduates must also submit a high school transcript or GED test results. Delivering high-quality instruction to nearly 32,000 students, Oregon State University is the largest institution of higher education in the Beaver State. 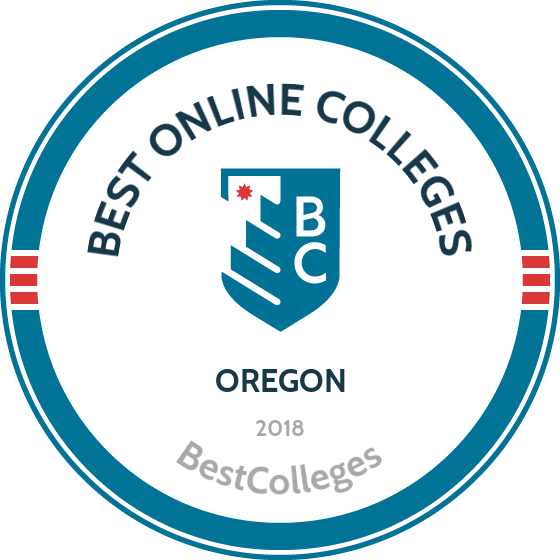 Consistently ranked among the most affordable online colleges in Oregon, OSU offers more than 45 online degrees at the undergraduate and graduate levels. It delivers these programs through more than 1,100 online classes. OSU’s terms begin in fall, spring, and summer. Military personnel may earn up to 45 credits for military education. Online and on-campus students pay the same tuition. Online students must also pay a distance education fee that supports maintenance of online programs. Portland State University is highly regarded among colleges in Oregon for its diverse student population, and affordability. The school has just under 30,000 students and maintains an average 19:1 student-to-faculty ratio. PSU offers online undergraduate and graduate degrees in fields like criminology, special education, and English. The school also offers several interesting certificates, including business of craft brewing and construction contracting. Applicants must have at least 30 college semester credits already completed. Applicants must have a 2.25 grade point average; a 2.0 is acceptable if the student holds either an associate degree or an Oregon transfer module. Graduate applicants must submit a college transcript as well as any program-specific materials required. The school is one of the most affordable online colleges in Oregon because of its low tuition rates and financial aid options. A Christian university with approximately 4,000 students from 35 states, George Fox University helps students lead meaningful lives academically and spiritually. The university offers several hybrid programs that combine face-to-face and online instruction. George Fox offers an online management and organizational leadership bachelor’s degree, as well as online graduate degrees in education, business, and seminary studies. Adult learners can complete their degree in 16 to 20 months depending on the number of credits in which they enroll. Undergraduates may enroll in online summer classes for half the cost of the traditional per-credit price. Located in Ashland, Southern Oregon University offers fully online classes that learners can access 24 hours a day, seven days a week. SOU also offers hybrid classes that combine face-to-face and online instruction. SOU’s online programs include business, criminal justice, education, and theatre education. Tuition is the same for all students regardless of where they reside. Undergraduates must have already completed prerequisites and general education classes before applying. SOU has one of the lowest tuition rates in the state, making it one of the most affordable online colleges in Oregon. Concordia University – Portland is a Christian university that welcomes students of any faith. Established in 1905 by the Lutheran Church, the school has a strong reputation among colleges in Oregon due to its academic quality and convenient online degree programs. Concordia offers several online bachelor’s, master’s, and doctoral degrees, including homeland security, early childhood education, and business. Classes are taught asynchronously to match students’ busy schedules. The university uses audio and visual technology for course lectures and makes class documents available for download anywhere and anytime. Each course requires 15 to 20 hours per week. The Adult Degree Program at Warner Pacific College offers accelerated courses so students can complete their degree quickly. Warner Pacific offers one online associate degree in organizational dynamics; three bachelor’s degrees in business, healthcare, and human development; and two master’s degrees in human services and management. Courses begin each month, so students can start their degree whenever they are ready. Applicants to the Adult Degree Program must have previously completed at least 48 college credits, earned at least a cumulative 2.0 GPA, and worked full-time at least two years. Located in La Grande, Eastern Oregon University’s online programs are designed for busy professionals. The university offers several online degree options, including in anthropology, economics, and history. The school also offers master’s programs include business administration and education. EOU has the lowest tuition in the state, making it the most affordable online college in Oregon. EOU admits first time college students and transfer students. The university partners with several community colleges in Oregon, Washington, Idaho, California, and Texas through its Fast Track Transfer Pathways program. This allows students to easily transfer associate degree credits to a bachelor’s degree program at EOU. EOU also awards scholarships to transfer and returning students pursuing an undergraduate degree. Founded in 1935, Corban University is a private Christian school located in Salem. The university offers two convenient, intellectually challenging online programs in business and psychology. Most students in Corban’s online programs work full-time, so the school has designed its classes to be flexible and easily accessible. Students may receive credit for previous training and professional experience. All students pay the same tuition regardless of residency status. Oregon has been a leader in online education in recent years, and institutions like Oregon State University continue to lead the way into the online education future. A recent Babson Survey reinforces the belief among academic leaders that online education is critical to the long-term strategy and success of their institutions and shows these leaders still have a high degree of confidence in the quality and learning outcomes of online education, with 74.1% rating online education as the same or better than traditional face-to-face instruction. Browse our list of the best online colleges in Oregon for more insight into distance learning programs in this state. Growth trends are slowing however, but are still considered to be a major component of higher education programs and will not be disappearing anytime soon. Online distance education is often cheaper and more affordable than traditional on-campus learning; Oregon Universities offer the same high-quality instruction online as they do on-campus. Debt is a major concern as tuition rises, and students who are seeking funding for college should be sure to plan carefully and explore the numerous grants, financial aid and scholarship options available. In 2012-2013, Oregon distributed $139.6 million in financial aid. A number of higher education funding initiatives are underway, including Oregon Promise, a campaign to offer free community college tuition. The Office of Student Access and Completion offers additional resources for postsecondary funding. Employment growth in this profession is strong in Oregon. According to the State of Oregon Employment Department, long term projections show an increase of 19% in the total number of jobs between 2014 and 2024. Wages increased by 2% from 2011-2016. In 2016, what were the top careers in Oregon for people who had a degree in business administration and management? Data source: State of Oregon Employment Department, Bureau of Labor Statistics. Data may not be available for every year. Employment growth in this profession is strong in Oregon. According to the State of Oregon Employment Department, long term projections show an increase of 22% in the total number of jobs between 2014 and 2024. Wages increased by 10% from 2011-2016. In 2016, what were the top careers in Oregon for people who had a degree in health/health care administration/management? Employment growth in this profession is strong in Oregon. According to the State of Oregon Employment Department, long term projections show an increase of 79% in the total number of jobs between 2014 and 2024. Wages increased by 7% from 2011-2016. In 2016, what were the top careers in Oregon for people who had a degree in psychology? Employment growth in this profession is strong in Oregon. According to the State of Oregon Employment Department, long term projections show an increase of 24% in the total number of jobs between 2014 and 2024. Wages increased by 8% from 2011-2016. In 2016, what were the top careers in Oregon for people who had a degree in registered nursing?